When the weather is beautiful, head to one of these spots for leisurely outdoor drinking. You may want to ignore the nibbles here (if hungry, see our guide to outdoor dining) but these are all great settings for sipping en plein air. We’re in the process of updating this list for 2019 but you can see our past selections below. 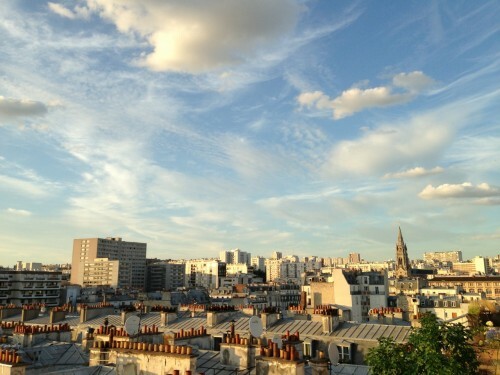 Le Perchoir (75011) – Watch the sun set over Sacré-Coeur from this rooftop perch in Ménilmontant. A scene on the weekends. Le Baron Rouge (75012) Join the rest of the neighborhood here on Sunday afternoons for a post-market glass of wine. Be prepared to use a curbside car as a perch for your glass. Café A (75010) A former convent provides sanctuary for those who’d like a peaceful drink near the garrulous Gare de l’Est. 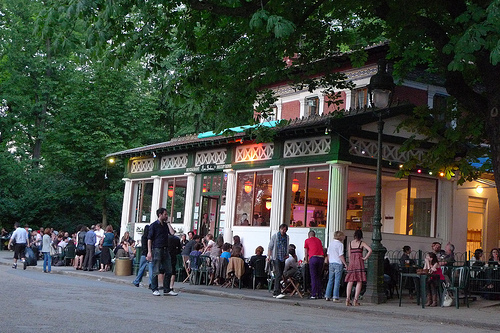 Point Ephémère (75010) – A canal-side drinking destination (live music inside) with occasional visits from Le Camion Qui Fume burger truck. Rosa Bonheur (75019) Absolute madness on the weekends, with hour-long lines to get in and a bouncer standing by. If you can’t deal, just bring a bottle of rosé and sip with friends on the grass nearby. Le Pavillon du Lac (75019) A collection of tables beneath the trees within the beautiful Parc des Buttes Chaumont. Much more relaxed and family-oriented than Rosa Bonheur. BarOurcq (75019) Chaise lounges, pétanque, and inexpensive draft beers by the Bassin de la Villette. A total scene on the weekends. La Rotonde (75019) Hot pink tables and plenty of potted plants pepper the Place de Stalingrad, with a view of the Bassin de la Villette. 25°Est (75019) Cheap pints on a large terrasse overlooking the Bassin de la Villette. What’s not to like? Le Saut du Loup (75001) Drink in the beautiful architecture of the Musée des Arts Decoratifs, then drink on the Philippe Boisselier designed terrace sandwiched between the Louvre and the Tuileries. Café Marly (75001) As close as you can get to the Pyramide du Louvre without waiting in line for hours. It’s Costes, and therefore annoying, but damn, it’s pretty. Le Déli-Cieux (75009) Shop till you drop at the Printemps department store, then quench your thirst atop the rooftop terrasse. It’s one of the best panoramic views in the city. Le Pavillon de la Fontaine (75006) Grab a rickety metal garden chair and soak up the dappled rays at this café inside the Luxembourg gardens. Le Petit Bain (75013) A neon green barge that is part concert venue, part restaurant, part floating terrace. Le Général Beuret (75015) Friendly service and a smattering of sidewalk tables on a placid square right off the Rue Vaugirard. 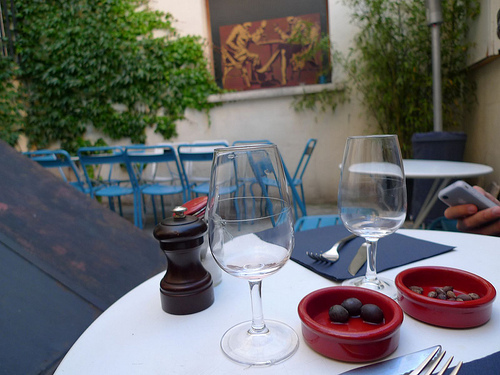 Happy Frites, a pint of beer or verre de vin alongside a plate of fries, is 5€ and runs every day from 6-8pm. Café Maure de la Mosquée de Paris (75005) Turns out they don’t serve alcohol at the mosque? So opt for a mint tea under the eucalyptus trees instead. Un Thé Dans Le Jardin (75009) Practice the romantic arts in the shaded garden of the Musée de la Vie Romantique. It’s hard to find a prettier or more peaceful place for a cup of tea. L’Heure Gourmande (75006) A quiet and cozy tea room with a few lovely tables on a cobbled passageway.